one mistake is repeated over and over because of a single error. card which was interpreted incorrectly. fact, that doesn’t mean the information is independent. ancestor of hers that I was investigating. As I began analyzing the sources of J.B. Burlison’s birth records, I realized that all of them were based upon his death. A Find-a-Grave entry, his marker, a Rootsweb cemetery index, and the Social Security Death Index were all consistent and gave his birthdate as 24 Jul 1924. The problem is that all of these records were based upon his death records and not his birth. A case could be made that his SSDI birthdate was based upon his SS Application, but he still entered the date of his birth in that application based upon what he was told, not what he witnessed. The only other corroborating evidence to his birthdate was the 1930 Census Record that indicated was born sometime between 1924 and 1925. Other than “Oklahoma,” it is only in J.B.’s various death records that his birthplace is reported — Pottawatomie County, Oklahoma. One source, the Find-a-Grave entry, indicates he was born in Wanette. This is 111 miles west of where his father & mother were living, according to the 1920 Census, in Canadian, Cleveland County, and 129 miles east of where they were living, according to the 1930 Census, in Oakdale, Washita County, Oklahoma. Because his father was renting farms in both censuses, it is possible that they were in Wanette, Pottawatomie County, in 1924. I would really like to find something that corroborates the birthplace. 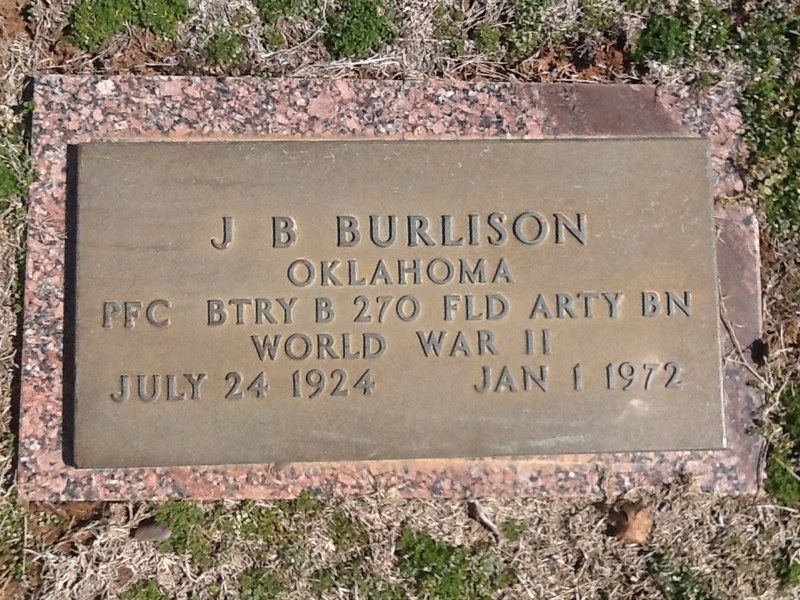 J.B. Burlison’s gravesite, according to Find-a-Grave, includes a VA Marker. That marker indicates he was a PFC (Private First Class) and served during WW II in the 270 Fld Arty. Based upon that marker I believe that J.B. did serve, however, initial research has not yielded any information regarding that service – Nothing on Fold 3 or my other military sources. In addition, I couldn’t find anything about a 270th Field Artillery unit. I wonder which is more likely, that the marker has a mistake or that there is nothing about a 270th Field Artillery unit on the Internet. (I suppose I could just not be searching properly but I hate to think that that is the case). In any event, it bears further investigation. Oklahoma appears, to me, to be one of the least helpful states for genealogists. They seem to keep virtually all records to themselves and only give records to immediate family. As such, I can’t find any records showing his marriage to Bertha (Bertie). I’m sure that J.B. & Bertha were married sometime between 1940 and 1955 (probably between 1949 and 1951). They were both reported as single in the 1940 census and were reported as married in the 1955 Oklahoma City city directory. J.B. was in an automobile accident in 1949 and the newspapers make no mention of his being married nor of a wife, so I suspect he didn’t marry Bertha until after 1949. They had a child born late in 1951, so I suspect they were married before his birth. J.B.’s death is well documented by his marker (Find-a-Grave), various indexes, and newspaper articles that talk about his auto accident and then talk about his death from the accident in the following day’s paper. 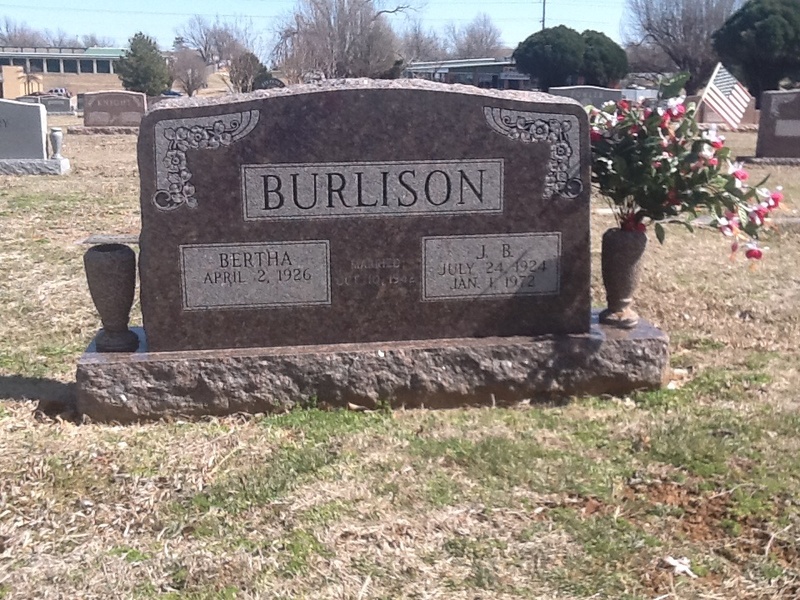 Find a corroborating birth record for J.B. Burlison recorded at the time of his birth. Find a marriage record for J.B. Burlison and Bertha (White). Find corroborating evidence of J.B.’s military service and information about the 270th Field Artillery.